Door spraying in white, using two component polyurethane based product. Guarantees durability and easy maintenance. We apply various coats, both of the base layers and the finish. After fixing any damage with a special two component filler, we give advice on the range of colours and finishes that fit best with your décor (plain colours, etched or veined). Coloured stain sprays (walnut, chestnut, pine, etc. ), pore sealing primers, clear polyurethane satin or matt varnish, for perfect results. We use washable matt plastic paint, breathable silicate paint or white washes (ecological and healthy) always of the highest quality for professional, spotless finishes; both in white and an extremely wide range of colours. Stucco, patinas, imitation of wood or marine, sponging, metallic effects, wallpaper, etc. We are at the forefront of the most advanced techniques on the market. Waterproof render and painting for facades of all kinds of buildings, from villas to offices, flats and communities. We have a hydraulic crane at our disposal and breathable silicate based paints in a wide range of colours. Open pore treatment, enabling the wood to breath, with a colour or colourless base. We carefully prepare the natural medium with a fine sand, we apply the desired colour and various coats of water based protector always sanding in between each coat. Cleaning with a descaling agent and controlled pressure washer. Subsequently we apply a water repellent paint with no shine so as to not alter the original colour of the stone or sandstone. Waterproofing terraces with diluted rubber and fibre-mesh. Cleaning floors with a descaling agent for the dirt, controlled presser washer and special non-slip liquids. 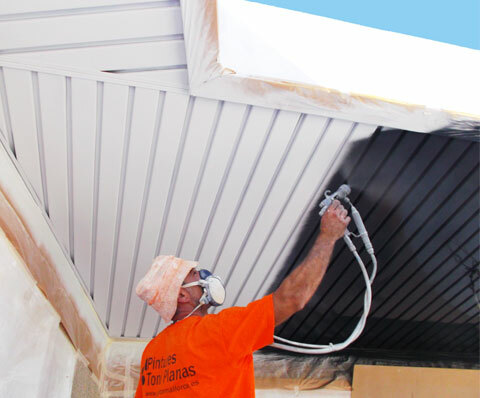 Equipped with high security elements we carry out painting jobs at height with a complete guarantee. We apply three coats of a top quality waterproof product. We manage the project with total professionalism and guarantee to meet deadlines. 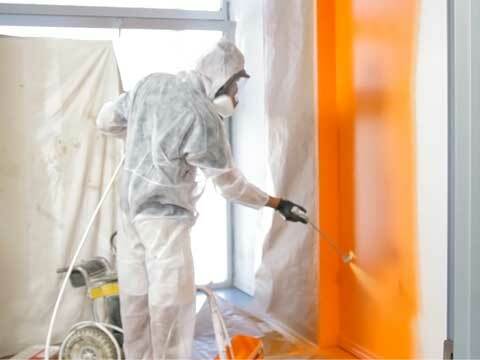 We carry out any kind of painting and decorating with maximum cleanliness, seriousness and top quality material. We use swimming pool paint that has guarantees of durability and chlorine resistance. We apply three coats of gloss water based varnish to shutters, sanding between each coat. We apply varnishes to iron and galvanized steel with primers that guarantee durability and shiny finishes, iron work, martelé, etc. 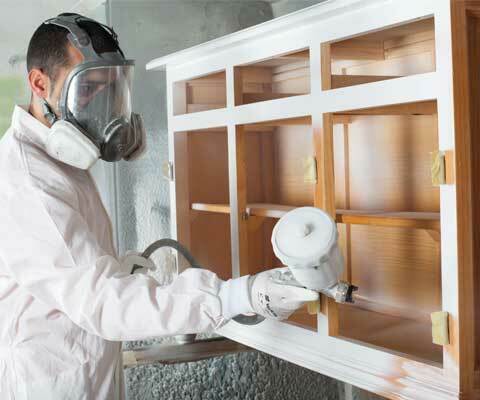 Mechanical application of flame retardant paints according to the microns needed for each job. Paints with a high resistance to heat and fire, mortars with perlite, standardized to achieve a fire resistance of up to R-240. We professionally level out irregular walls, using a sanding machine. We scrape the base and apply a special paste of plaster accomplishing a perfectly smooth finish on walls and ceilings.